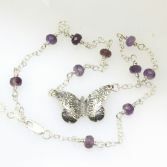 This Beautiful Large Butterfly Necklace with Amethyst bead has been designed crafted and hand finished in the workshop by me. The large chunky Butterfly has a pretty decorative flower pattern stamped into the wings, the wings are shaped and curved to create movement which catch the light beautifully. 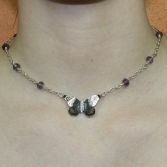 The Butterfly is made from solid sterling silver and measures 32.0 mm at the widest point by approximately 20.0 mm. 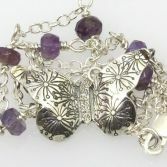 It hangs on a strong sterling silver trace chain with links that measure 3.0 mm by 2.50 mm with pretty facetted Amethyst beads which have been wire wrapped in sterling silver wire. The total length is 16'' inches and 17'' with the extension chain, and it has a strong 11.0 mm lobster clasp to securely fasten it. If you require a longer please contact me! 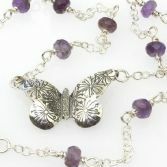 The Large Butterfly With Amethyst Beads has full UK hallmarks. Your Butterfly Necklace will be presented in one of our signature gift boxes and posted via Royal Mail special delivery (signed for) to any UK address free of charge.